The following brochures are available from the First Amendment Center free of charge at the number above or you can use the link below to download them in .pdf format. The first three are must-reads and the others offer additional resources. A Teacher’s Guide to Religion in the Public Schools. First Amendment guide for teachers to know what can and can’t be done in the public school environment. 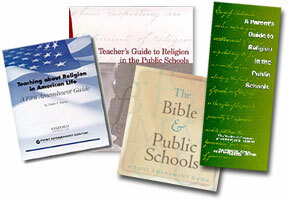 The Bible & Public Schools: Prepared by First Amendment Center and the National Bible Association this guide explains how schools can legally teach about religion, the Bible and other sacred texts. Public Schools & Religious Communities. How faith communities can work alongside public schools without violating Constitutional mandates. Public Education and Sexual Orientation, which BridgeBuilders contributed to.